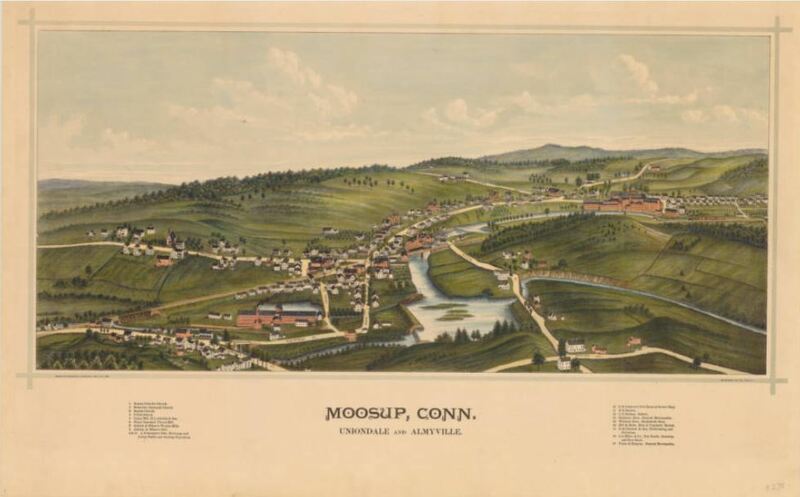 This 1889 view of Moosup (today a village of Plainfield) is by Lucien Burleigh. Educated to be a civil engineer, Burleigh switched to a career as artist, lithographer, and view publisher and is one of the few artists of a large number of views to have operated his own lithographic printing establishment. Burleigh’s bird’s-eyes are drawn from a lower perspective than those by O.H. Bailey, a prolific Boston-based publisher. Creating eerily unpopulated cities, Burleigh left out the tiny figures and animals that populate Bailey’s views. His carefully rendered buildings and streets are united by the deep, rich greens of his views. 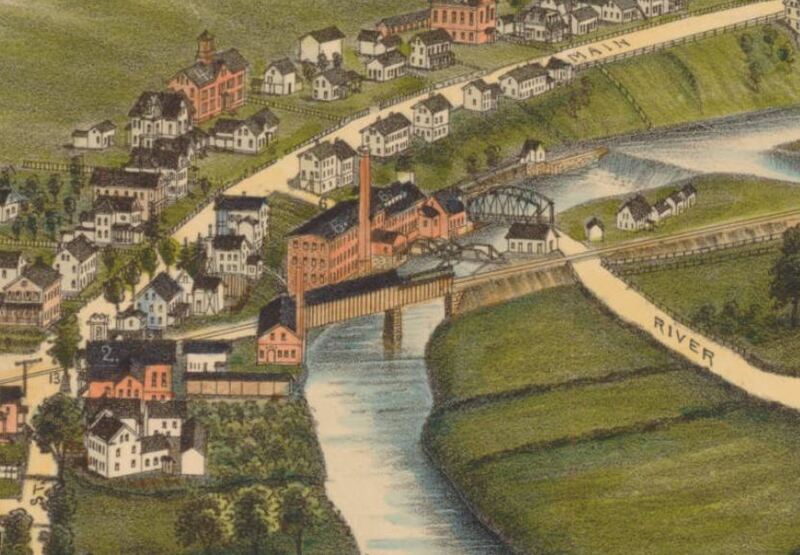 Burleigh’s depiction of this Quinebaug Valley town and its satellite communities, Uniondale (left) and Almyville (right), records the appearance of a typical mill town common in northeastern Connecticut during the late 19th-century textile boom. Drawn to Moosup by its easily accessible source of water power, the Cranska Thread Mill (#6, center), the Uniondale cotton industry (#5, lower left), and Almyville’s Aldrich and Milner Woolen Mills (#7, right center) are each housed in large brick buildings, surrounded by workers’ tenement houses. In addition to providing employment for many local residents and French Canadian immigrants, Aldrich and Milner were responsible for endowing the town’s library and a recreation hall (#8, right center).